Want to widen your sonic palette while working in Ableton Live? These seven essential plugins will complement your Ableton workflow and open new production possibilities by giving you effects not included in Ableton’s stock selection. Ableton Live has long-developed its reputation for being a unique DAW. Its workflow and functionality provides users with a totally new way of developing musical ideas, producing full songs and performing live. While Live 10’s status in the electronic music world is undisputed, there is certainly room for unique plugins to complement its included stockpile of effects. Here we’ll discuss a few selections which can fill that void, and get you closer to the sound you’re searching for. This is a plugin which suits any type of voice recording, whether it’s singing, spoken word or voiceovers. It constrains the upper and lower volume limits of a vocal track to keep the performance sounding nice and smooth without any of the side-effects of a compressor. Vocal Rider works by setting a target range for the vocal level in relation to the rest of the mix. It then intelligently responds to natural deviations from the target by turning the gain up and down on the vocal. You can use the range control to narrow the dynamic range, and the output control to raise or lower the overall level. This is a one-stop method to make your vocals sound more controlled and produced immediately, and you can choose the mono, stereo or live versions, making it particularly suited to Ableton for live performance. Controlling the dynamics of the voice this way means you can use your compressors and limiters purely as tone shaping tools, evening out the vocals more naturally without unnecessarily ‘squashing’ them. Following the lead of Vocal Rider, this plugin applies the same concept to the bass. The spine of any mix, a good bass part is essential for both rhythmic and harmonic functions, often playing a big part in having the listeners get up and dance. Bass Rider ensures that the bass pops out consistently, and doesn’t get lost in the mix. Again, this plugin works without relying on compression techniques, just leveling your existing sound so that it’s more even without feeling needlessly compressed. Ableton Live doesn’t have anything like these Rider effects on board; they are serious time savers and performance enhancers. When trying to add an organic, analog feel to electronic instruments, tape emulations fit the bill perfectly and can work wonders. Waves offers two different tape simulations, allowing you to fit the project you’re working on. More garage-sounding retro guitars can benefit from the Abbey Road J37 Tape, whereas the Kramer Master Tape can suit electronic sounds that need a bit of smoothing out, especially recordings of tabletop synth jams. These plugins add an organic tape sound and impart a nice bit of bloom to the low end. Be sure to leave the noise emulation off unless you really want it, especially if you’re using more than one analog style plugin; the noise can quickly add up. Another thing missing if we look through Live’s library is pitch correction. Pitch correction is almost a staple in most genres of modern music, either as a subtle correction for the vocal, or a full-blown tuning or formant effect. Luckily, there’s Waves Tune. To begin using it, set your song key if you know it, and otherwise leave it set to chromatic, and Tune will figure it out. Scan your audio; if necessary make some manual tweaks. The ratio control lets you mix in the amount of correction, which can keep things sounding more natural. You can also use these indicators as a visual reference for how in tune your performance is. Tuning is very useful for any production, especially if you’re stacking up vocal harmonies or backing vocals and things need to be a little tighter across multiple tracks. Waves Tune Real-Time works to achieve the same goal in correcting the pitch and tuning of a performance, but it does so even more quickly and easily. Depending where you set the speed knob, it will operate with a sound that’s anywhere from extremely transparent to one that’s far more noticeable and robotic: whichever fits your needs. In this plugin, it’s also helpful to set the key and the range to the track you’re working on, or leave it in chromatic mode as a catch-all. Especially when used together with the more surgical Waves Tune plugin, you’ll have everything you need to get any performance to be crispy and in-tune, and avoiding a shaky production. Center is an interesting plugin which can be a powerful manipulation tool on your mixes, masters and even live performances. Using simple intuitive controls over the separate center image of the mix and the left-right sides content, you can alter the balance either subtly or drastically. Center allows you to reposition, isolate and even eliminate elements within the mix, all from a single plugin with simple controls. Center can be useful in live situations, for example, if you want to bring down the energy for a sparse section and then drop it back in dramatically, you could automate the side image to duck in and out. There’s also a simple EQ balance function and punch control. These few plugins certainly add something useful and unique to Ableton Live 10, and they work very nicely together. This selection covers only a small tip of the sound tools that Waves offers, but are nonetheless extremely functional and add utility that you can’t otherwise get while working in Ableton. Want to discover more essential plugins? 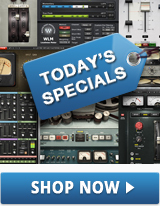 Learn how to choose the best compressor for the job, or which vintage EQ plugin to use.